(P1) Sully took flight in theaters this weekend and has landed with a solid $35.5 million to take the top spot at the box office, according to studio estimates Sunday. 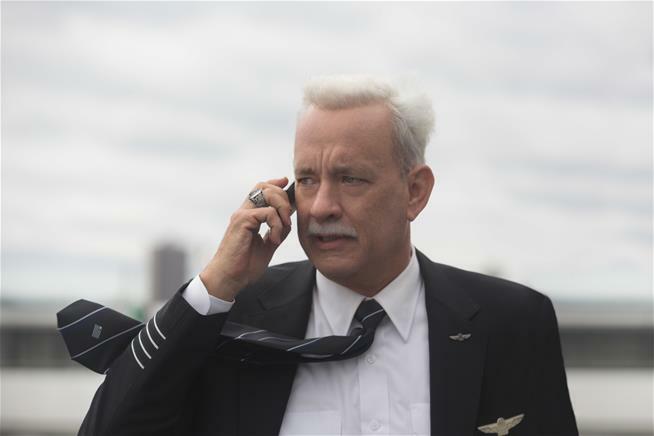 The Clint Eastwood-directed film about the Miracle on the Hudson stars Tom Hanks as Captain Chesley “Sully” Sullenberger, who made an emergency landing of US Airways Flight 1549 in the Hudson River in 2009, minutes after taking off. The Warner Bros. film cost a reported $60 million to produce and scored particularly well with audiences, reports the AP; it’s also the best debut for Eastwood as director, notes USA Today. (P2) Taking second place with $15 million is the Screen Gems thriller When the Bough Breaks starring Morris Chestnut and Regina Hill. Holdovers Don’t Breathe and Suicide Squad took spots three and four, while the animated The Wild Life opened in fifth with a dim $3.4 million. Did you or will you watch this movie? Why or why not? Do you think Captain Sullenberger is a hero? Why or why not? How do you think you would have felt if you were on the flight that landed in the Hudson River? Who is the director of the movie, Sully? What is the number of the flight Captain Sullenberger landed in the Hudson River? How much money did the runner up film make? Which two movies did not debut, but made the box office list?